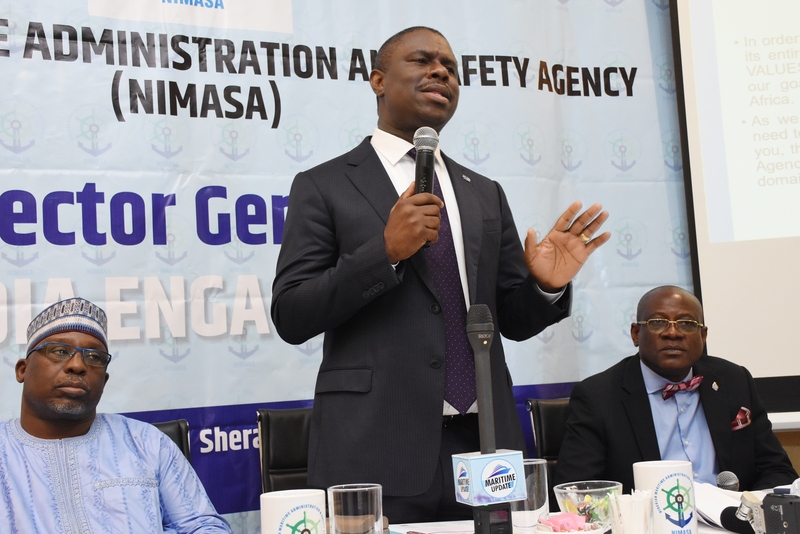 The House of Representatives Committee on Maritime Safety, Education and Administration has commended the Management of the Nigerian Maritime Administration and Safety Agency (NIMASA) for its efforts in repositioning the country’s maritime sector for greater efficiency. The committee gave the commendation in Lagos, when it paid an oversight visit to the Agency’s headquarters. Chairman of the committee, Hon. Mohammed Umar Bago, who led the House delegation, expressed confidence in the Management of NIMASA, saying his committee is impressed with the Agency’s budget performance in 2018. Bago, however, noted that there was room for improvement in the remaining part of the year and in 2019. The House Committee Chairman’s remarks followed a presentation by the Agency on the 2018 budget performance, which was based on the five-point transformation strategy of the Dr. Dakuku Peterside-led Management. Bago observed that there had been improvements in the Agency’s activities, saying it is a welcome development for the country’s maritime industry. “We wish to assure you that as a responsible Committee, we are poised to continue to give NIMASA the required legislative backing in ensuring that it achieves its mandate in order to realise a robust maritime sector,” Bago said. He also expressed delight in the operation of the Satellites Surveillance System put in place by the Agency to check and monitor the activities of vessels on the Nigeria’s territorial waters. He assured that the National Assembly was working on the speedy passage of the Anti-Piracy bill proposed by the Agency, noting that it will help to nib illegalities on the country’s waterways in the bud. He also applauded NIMASA for the successful berthing of its recently-acquired modular floating dockyard in the country, describing the facility as an asset that should be promptly put into operation for revenue generation. “Let us put that asset to use and generate revenue,” the Committee Chairman stated. He used the opportunity to commend the Management of the Agency for its commitment to staff welfare, promotions and trainings, and urged that the tempo should be sustained, as it will help the Agency realise its vision of being the leading maritime administration in Africa. Responding, the Director-General of NIMASA, Dr. Dakuku Peterside, expressed gratitude to the Committee for their support to the Agency. Dakuku, who was represented by the Agency’s Executive Director, Finance and Administration, Mr. Bashir Jamoh, reiterated NIMASA’s commitment to working together with the Committee to achieve the common goal of growing the maritime industry and developing the country. Dakuku said the Agency remained committed to keeping up with international standards. “On our part as an Agency, we are working on improving the entire maritime sector on a daily basis, from good to better and to best. Through this, we will be able to compete favourably with our counterparts in other maritime climes,” he said. On capacity development, which is one of the five strategic pillars of the current leadership of the Agency to revamp the sector, the DG stated that training and retraining of staff was a major focus of his administration. He said the capacity building initiative had helped to improve the productivity and professionalism of the workforce. Dakuku assured members of the Committee that the legislature remained a viable partner and stakeholder in the drive to achieve a robust maritime sector in Nigeria. The Dakuku-led management of NIMASA has since its inception introduced several transformation initiatives that have been nurtured through collaboration with stakeholders, both locally and internationally.